Over 40 defibrillators have been installed around our island since Islander Jack Sutherland’s cardiac arrest at a Rotary meeting. 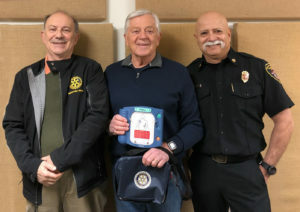 Listen here as BIFD Fire Chief Hank Teran, Rotary president Robin Goldston, and Jack Sutherland describe this remarkable project: a heartwarming story for American Heart Month. Chief Teran was attending a rotary meeting when Rotarian Jack Sutherland suddenly collapsed in full cardiac arrest. Chief Teran assessed the situation, immediately began CPR with the help of Rotarian Sean Marcella, and called for a defibrillator. 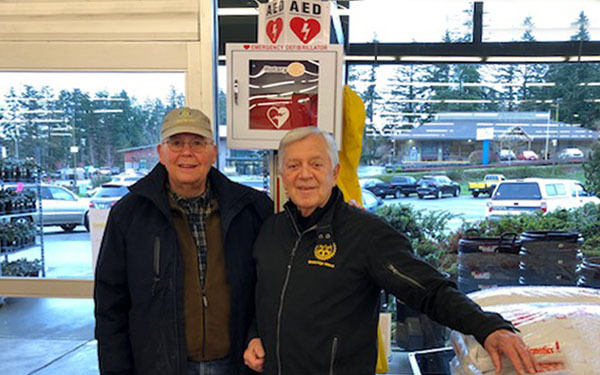 Aid cars arrived carrying the vital equipment, and three shocks and a helicopter transport to Harborview later, Jack was able to survive with no repercussions. But survival wasn’t enough for Jack. Realizing that without the quick actions of Teran, Marcella, and the defibrillator he would not be here today, Jack spearheaded a Rotary project to spend $25,000 of auction moneys installing AEDs — Automated External Defibrillators — in police cars, at Parks District locations, and throughout the island, to ensure that these life-saving devices would be more readily available to anyone in need. Jack, who negotiated the sale of the units, installs them himself with the help of Rotarians Tom Lindsley and Tom McCloskey. He also trains people at each installation on how to use the units, and photographs the units for BIFD to add to the PulsePoint app so they’re easier to locate. Curious about AED’s and CPR? BIFD offers monthly hands-on training classes in both. To sign up, visit the BIFD website at https://www.bifd.org/classes-and-registration. And to get instant access to AED locations on the island, be sure to install the PulsePoint app on your mobile device.